On a cold January day in 2017, nearly two months before due date, Nile hippopotamus Bibi gave her keepers at the Cincinnati Zoo & Botanical Garden a big (little) surprise—a tiny newborn hippo, no bigger than a football. The first premature hippo born and raised in captivity, baby Fiona was an underdog from the start: she couldn't nurse, she couldn't stay hydrated, and she wasn't thriving. But the staff at the zoo knew they could save her. It would take creative thinking and teamwork. They would have to study the makeup of hippo milk for the first time ever and reach out to medical colleagues, including a team at the local Children's Hospital with superior vein-finding skills, to ensure that Fiona would begin to gain weight and become healthy. 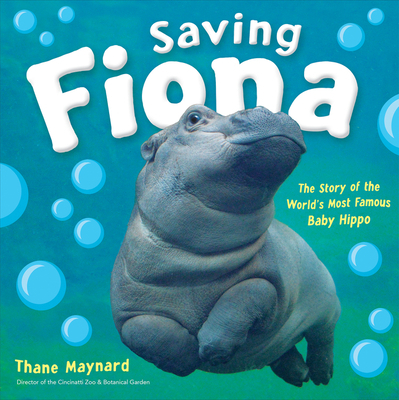 When Fiona began to thrive, her star began to rise, and soon she became an internet sensation, her picture and videos garnering thousands and thousands of likes and fans on Instagram and Facebook. Now a Fiona appearance at the Zoo mimics a Beatles concert. What made this little, now big, hippo such a big hit with people all over the world? And what's in store for her and her family in the future? Thane Maynard was born and raised in central Florida, where he earned his bachelor’s degree in environmental studies from Rollins College in Winter Park, Fl., and his master’s degree in wildlife ecology from the University of Michigan School of Natural Resources. He is also a graduate of the Strategic Perspectives in Nonprofit Management program at the Harvard Business School, as well as the first National Education Leadership Institute sponsored by WWF and Disney. He is an active member of the Association of Zoos and Aquariums (AZA), and a member of the Board of Trustees for the Margo Marsh Biodiversity Foundation, a primate conservation fund headquartered in Washington, D.C. He travels extensively throughout the world.